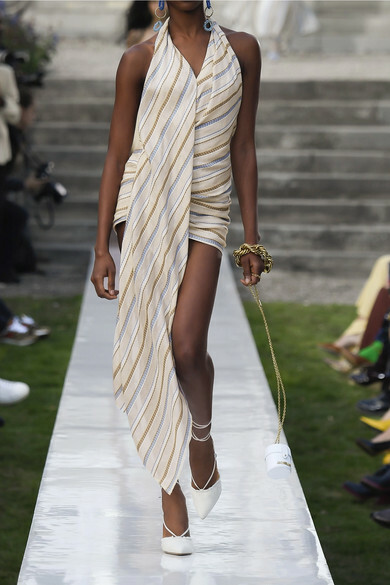 This 'Spezzia' design is inspired by the idea of "draping a scarf casually around your body into a dress after having a swim," explains Simon Porte Jacquemus. 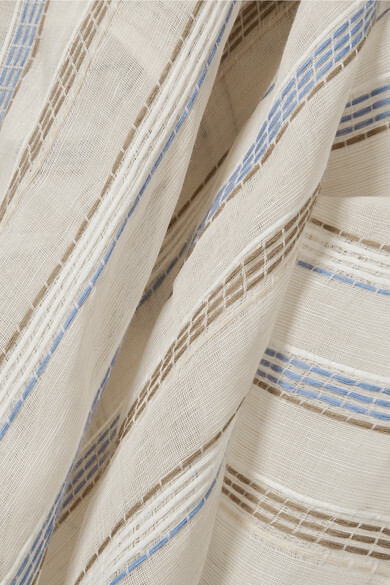 Embroidered with sky-blue and oyster stripes, the beige cotton it's made from is blended with linen for lightness. It's cut in a mini length with a long draped panel and turns to reveal a completely open back. Echo the Paris runway by styling yours with shoulder-grazing earrings and a really rosy blush. Shown here with: Rosantica Clutch, The Row Sandals, Jacquemus Earrings, Chan Luu Cuff, Monica Vinader Cuff, Jennifer Fisher Cuffs.